Hanging a Health and Hygiene Center is one of the easiest ways to help prevent the spread of hospital-acquired infections (HAIs) and viruses such as H1N1 and H5N1. The economical Sanitizing Station organizer holds a modest amount of infection control supplies. It’s a good option for low-traffic areas and tight spaces. Durable acrylic frames protect and clearly display your documents. The Premium XL Health and Hygiene Center helps stop the spread of infections in high-traffic areas. 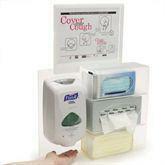 This convenient center features a touch-free, automatic hand sanitizer dispenser. 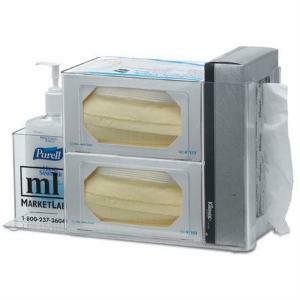 Users never run out of sanitizer when they need it, and you don’t have to refill it as often. It’s one of the easiest and most-effective ways to promote the CDC’s Cough Etiquette campaign. Health and Hygiene Kiosk (Stand Only) is designed for use with VWR's exclusive hygiene center. Premium Health and Hygiene Center features a key lock that prevents theft of contents and is pre-drilled for mounting to walls (hardware not included). 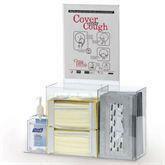 The Respiratory Hygiene Station is an economical organizer for infection prevention supplies. The provided sign holder has space for you to add your own message about how to prevent the spread of infection. 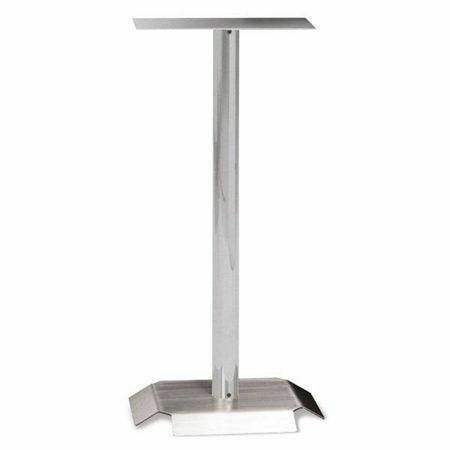 It can be mounted to the wall or placed on a tabletop.